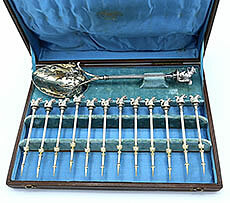 A George Sharp boxed nut set circa 1865 in the original fitted case comprising twelve nut picks and a nut scoop with squirrel terminals. A George Sharp antique silver cheese knife with engraved blade and three heavy duty teeth at the tip of the blade. Never monogrammed. Length 8". Weight 2.30 toz. 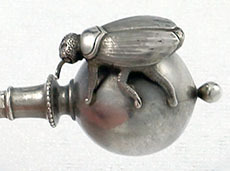 A large antique sterling silver nut scoop by George Sharp with a pierced canopy over the bowl surmounted by a cast silver squirrel. Large squirrel terminal. Length 10 1/2". Weight 4.45 toz. 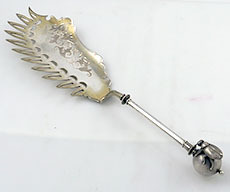 An antique silver cheese scoop with the mark of George Sharp, a chunky item with a weight of 2.9 toz and a length of 8". 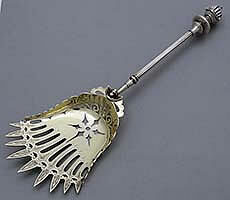 The scoop has a gold washed engraved blade and an applied mouse on the handle. The terminal has a large three dimensional applied bull head. Nice clear marks and the word sterling on the handle. Engraved detail on the edges of the blade and the handle. 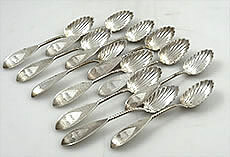 A thirteen piece dessert set by George Sharp of Philadelphia comprising twelve 5 1/2" spoons and one 11" serving spoon. All monogrammed on the reverse of the bowls. Lightly gold washed bowls. Cast cat tail and leaves applied to each handle. 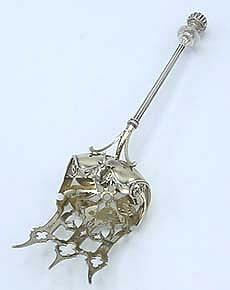 A rare George Sharp sterling serving fork with a canopy mounted by a stag head. The terminal is a knight's helmet with a mouse. Excellent condition with perfect gold wash. Length 11 1/2". Weight 4.9 toz. 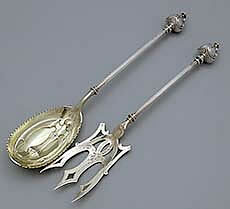 A large rare George Sharp serving fork with a knight's helmet and mouse terminal, gold washed engraved and pierced bowl. Length 11 1/2". Weight 4.25 toz. 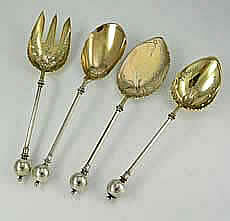 An antique George Sharp salad set with a Gothic Dome terminal and gold washed bowls. The handles have a milled grip and the tines and bowl have some additional decoration in the form of engraving. Length 11". Weight 7.5 troy ounces. 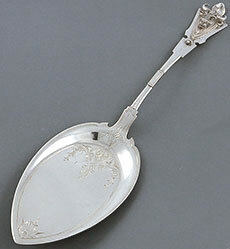 An antique sterling silver large serving spoon with an oval bowl and engraving on the front of the handle and edge of the bowl. 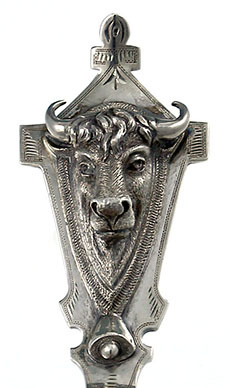 There is an applied three dimensional bull head on the top of the handle. Lightly gold washed bowl. Length 10". Weight 3.10 troy ounces. 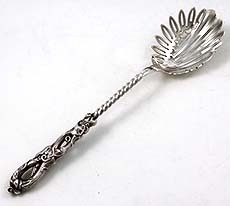 A George Sharp for Bailey and Company of Philadelphia sterling silver pie server with an applied bull head on the top of the handle. 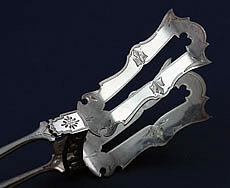 Engraved decoration on the blade and on the front of the handle. A large impressive pie server measuring 11" with a weight of 3.85 troy ounces. 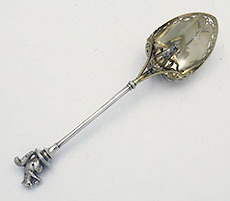 A large important George Sharp silver scoop circa 1865 with a lion terminal, pierced fluted gold washed bowl scoop shaped bowl and a small cast applied child with pointed hat on the edge of the bowl. Hand engraved decoration on the bowl. Length 11 1/4" . Weight 5 troy ounces. 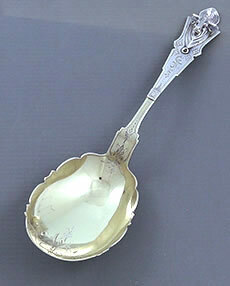 A large sterling serving spoon by George Sharp for Bailey & Company with a bull head on the handle. Monogrammed on the reverse. The bowl has bright cut decoration and the gilding is in good condition. Weight 4.45 troy oz. Length 11"
A long handle sterling macaroni server by George Sharp with a naturalistic looped branch handle and twisted shaft. Length 11"; weight 3.75 troy oz. Good condition. 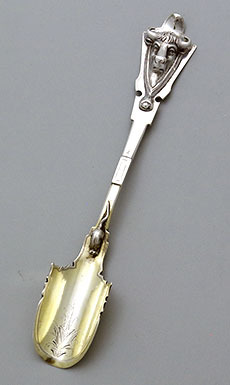 A George Sharp sterling silver macaroni server with gold washed blade (on the front) and ball with an applied bug on the handle. Marked Patent 1883, G.S., Sterling. Length 11"; weight 4.45 troy oz. 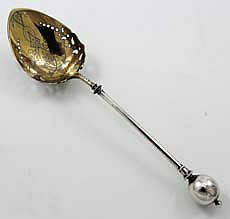 A large pierced deep bowl serving spoon with ball terminal bearing a monogram. Gilded engraved and pierced bowl. Length 10 1/8"; weight 3.20 troy oz. 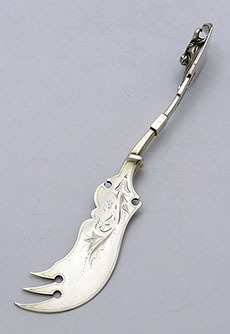 An exceptionally long sterling silver antique tongs with three claw prongs at the tip. Never monogrammed. Retailed by Bailey and Co. 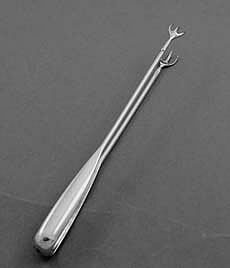 Length 8 1/2"
A large antique sterling asparagus tongs by George Sharp with fine engraving on the blades and a pierced bar holding the arms in place. The bar is held in place with the original nut. Circa 1865. Excellent condition. Length: 11 3/4" Weight: 6.4 troy oz. 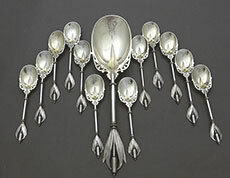 Suite of four George Sharp Ball pattern servers comprising a deep bowl pierced serving spoon, a two piece salad serving set (10 1/2" long) and a flat server measuring 10 7/8". Combined weight 14.65 troy ounces. All four pieces have a wonderful deep gold color gilt. The bowls are also highlighted with fine engraving.